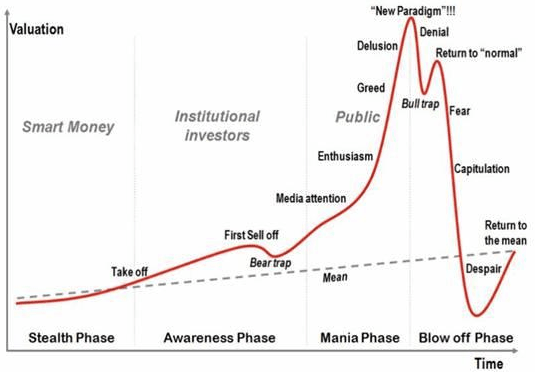 “A speculative bubble is a situation in which news of price increases spurs investor enthusiasm, which spreads by psychological contagion from person to person, and, in the process, amplifies stories that might justify the price increase and brings in a larger and larger class of investors, who despite doubts about the real value of the investment, are drawn to it partly through envy of others’ successes and partly through a gambler’s excitement.” – Robert J. Shiller, economist, Nobel prize winner, and author of the New York Times Bestseller, Irrational Exuberance. Does any of the above ring a bell to what has occurred recently in Vancouver? I certainly think so. It all started in the detached market around February, 2015. 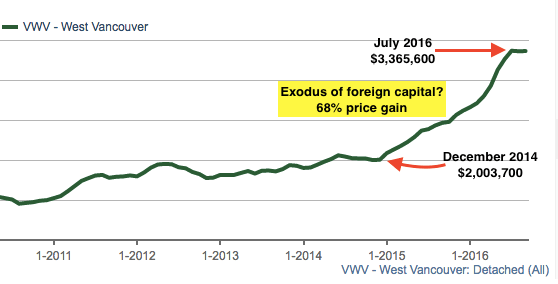 In what appears to be a mass exodus of foreign capital. China’s economy begins to falter, a panic sets in and a flood of money exits the country into safe havens such as Vancouver real estate. A typical West Vancouver home (well out of the reach of local income earners) sells for $2,003,700 in December of 2014. Prices explode to $3,365,600 by July 2016, an increase of 68%. West Vancouver house prices increase 68% in less than 2 years. This epidemic spreads across Greater Vancouver sparking outrageous price growth. From January 2015-July 2016 prices increase 57% in East Vancouver, 67% in Richmond, 67% in Tsawwassen, 62% in South Surrey, 60% in North Delta. The fear of missing out sparks mass hysteria as locals rush to get into the market before they get priced out forever. Many turn to more affordable options and soon home prices in the Valley take off. People start throwing cash at homeowners in a flurry of bidding wars and risky subject free offers. From January 2016-August 2016 prices explode 27% in Langley, 27% in Maple Ridge and 31% in Abbotsford. Even places like Mission that had zero price growth for almost 5.5 years see an unprecedented boom. To everyones bewilderment, multiple offers ravage the small town of 38,000 people and prices take off. From January 2015- August 2016 prices soar 56%. 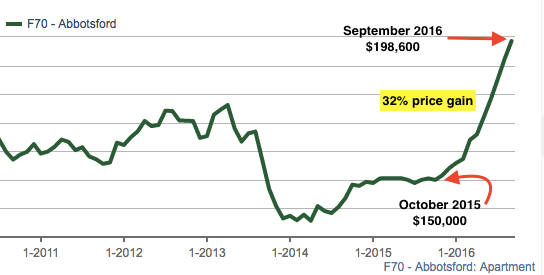 Mission home prices stagnant for years explode 58% in 20 months. Roughly six months later, as detached prices become out of reach buyers turn to more affordable options. The contagion hits the condo and townhouse markets. Following a similar pattern as the detached market, Vancouver heats up first and soon the fever spreads across Metro Vancouver and into the Valley. From July 2015-July 2016 condo prices soar 32% in Vancouver, while townhouses see 35% price gains. As many begin to try and rationalize recent price gains, developers push for more supply. Trying to fix a demand issue of psychological contagion with new supply, which takes years to build. Areas such as South Surrey, which a year ago had too much supply, suddenly lacks a shortage almost overnight. South Surrey condos go from an average selling time of 42 days in January to 11 days in August. Prices increase by 28% in the subsequent months. South Surrey condos soar 28% in 8 months. The same thing can be seen in Abbotsford, a city with an abundance of land where most condo owners normally lose money. Suddenly, in less than one year prices somehow explode by 32%. Abbotsford condo prices up 32% in less than one year. Pundits continue to justify recent price gains. Claiming Vancouver has always been expensive, land is limited, and it’s a beautiful place to live. It’s evident we have witnessed the peak of home prices. Things are now cooling with many real estate industry experts finally calling for a correction in home prices. Just last week CEO of Royal Lepage Phil Soper said real estate prices have seen their “final hurrah.” National Bank also predicts detached prices to fall 20% over the next year. Where is Vancouver Real Estate? I believe we have just witnessed one of the most impressive housing bubbles in history. Perhaps this bubble doesn’t pop, maybe it just deflates. But one thing is for sure, Vancouver just experienced a bad case of irrational exuberance.